As usual, Singaporean dealer Music Sanctuary had a massive presence at the CanJam Singapore 2019 show floor. 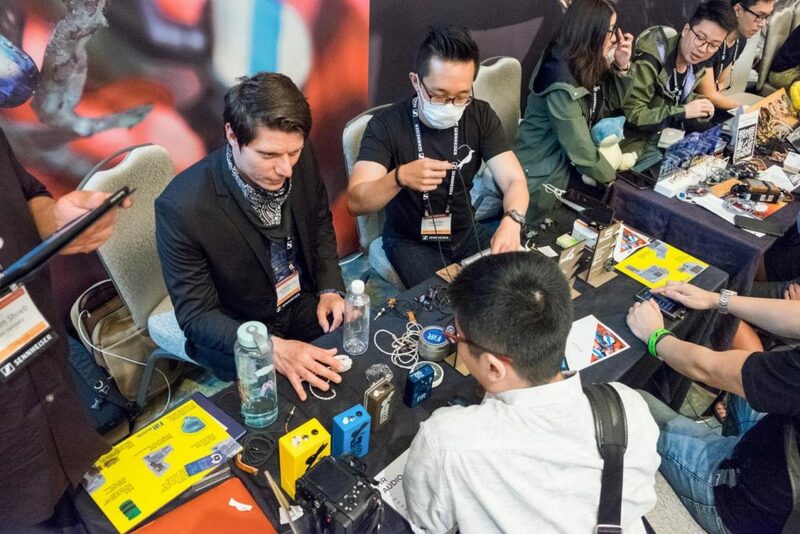 They brought along an extensive arsenal of brands, including one of the world’s most lauded in-ear manufacturers: 64 Audio. Representing them was Fillip, who I had a fantastic time speaking with. He had lots to say about headroom and dynamic range in relation to an IEM’s driver count, and I truly appreciated the passion and knowledge he brought to the show. Now, I’d already heard 64 Audio’s IEMs previously, but I did want to revisit one that was due for some justice: The U12t. I spoke about the U12t in my coverage article last year and praised its improvements over its predecessor, but it was one of the last things I heard at the show, and I felt the fatigue affected my impressions. Now armed with a fresh set of ears, I came into the U12t with a clean slate, and only then was I able to truly appreciate the technique that it had to offer. 64 Audio U12t: The U12t possesses a balanced, neutral tone; coherently linear from top-to-bottom. Paired with superb headroom, stereo separation and resolution, it’s perhaps 64 Audio’s most studio-ready in-ear monitor yet. But, through clever pockets of energy along the mid-bass, upper-midrange and upper-treble, it possesses ample musicality as well. It rides the line expertly between work and play, with outstanding technical performance guaranteed in both respects. Dynamic range is one of its most strongest assets. As a track crescendoes, the U12t does too. This creates a remarkable, theatrical sense of drama and scale with compositions like Jennifer Hudson’s And I’m Telling You I’m Not Going, or Mariah Carey’s When You Believe, or Snarky Puppy’s Go. The in-ear creates a vast sense of space, so the listener is able to take in all those instruments effortlessly. Then, when new elements comes into the mix or the track gains new flavours, you can follow along with that growth. Whereas with weaker in-ears, all you’d notice is the track getting more and more crowded. Resolution is marvellous throughout as well. Instruments are well-defined, fully-rendered and well separated from each other. There’s little in the way of rich, indulgent warmth, but the bigness and vibrance of those instruments – as well as the building effect I decribed – compensates for that. This allows the U12t to maintain both charisma and performance. In tone, the U12t is one of the most clear-cut neutrals I’ve heard. I find its balance and headroom ideal for professional editing and mixing. The low-end is linear and transparent – clean, tight and impactful without being intrusive. The top-end is as stunningly clear and airy as tia has always been. Perhaps, I would ask for a bit more 1-3kHz energy to further densify the midrange and solidify the chesty fundamentals. But nevertheless, that’s one gripe in a technical powerhouse of an in-ear monitor – a marvel in transparency, resolution, headroom and space, whilst remaining musical all the while. 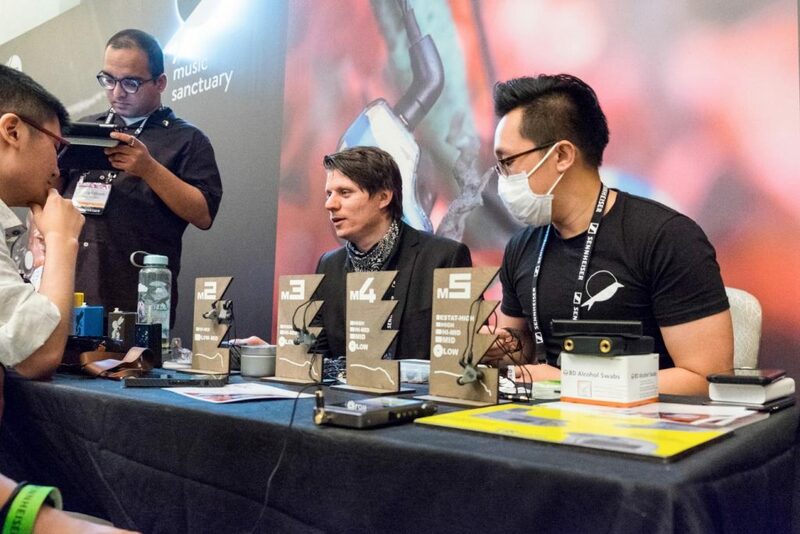 Music Sanctuary also showcased a product from Fearless Audio – their flagship in-ear system: The Y2K. It was described to me as an “Ultimate Ears Personal Reference Monitor on steroids,” and that certainly looks to be the case. The in-ears are connected to a DSP of sorts that allows the user to manipulate its final frequency response. The top row allows you to alter the amplitudes of frequency ranges labeled Ultra Low, Medium Low, Medium High and Ultra High. The bottom row then decides where this emphasis lies by determining the crossover’s cut-off point. There are two additional knobs that alter phasing in order to manipulate the in-ear’s imaging and stage expansion. All three knobs operate on a scale of 1-9. Fearless Audio Y2K: The Y2K in its base form had a linear, balanced, neutral tuning. Apart from an articulate treble, nothing really stuck out to me in terms of peaks or dips. Turning the knobs, I found I was able to tune the Y2K into more laid-back and more energetic version of its inherent signature. But, in terms of note-size, timbre and tone, it doesn’t sway much. I’d say the tuning portion encapsulates about 30-40% of the Y2K’s final signature, so you do have to buy into the base sound to some degree. I was told that you could purchase the 10-driver IEMs complete with the tuning box plus a proprietary 5-pin cable with your favourite DSP setting dialled in. Or, you could opt for just the latter. Either way, I think it’s a brilliant concept I’d love to see mature in flexibility and compactness. Nevertheless, kudos to Fearless Audio. OTCM is a company I was introduced to at the show. 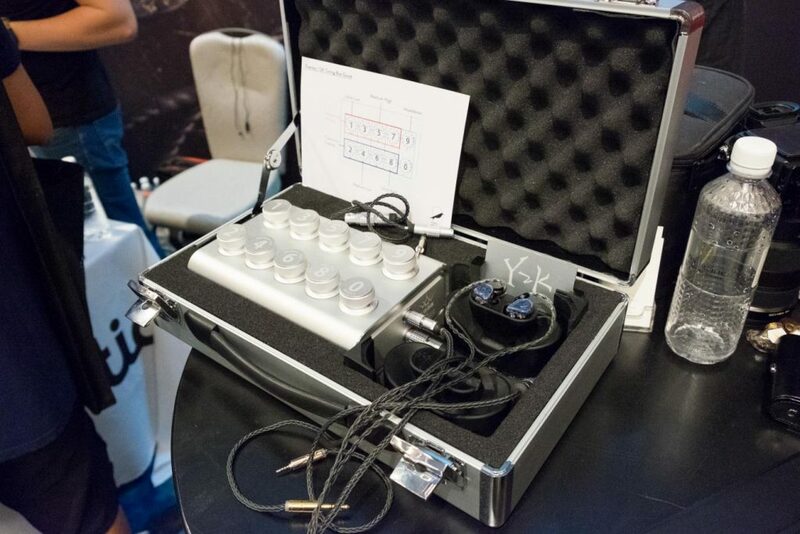 Displayed at the Music Sanctuary booth were their fully-wireless IEMs: J.ear. The monitors use Bluetooth technology to pair with each other and the source. Touching the faceplates also activate an active noise-cancelling feature for use in flights, office spaces, etc. What’s unique about J.ear is that they’re offered in a custom form factor. It’s the first I’ve ever heard of a custom, fully-wireless IEM. And rationally so, there were still certain kinks to be ironed out. The Music Sanctuary staff were admirably honest in saying that the J.ear was not yet a perfect product. One in particular mentioned the ANC switch being too sensitive to the touch. 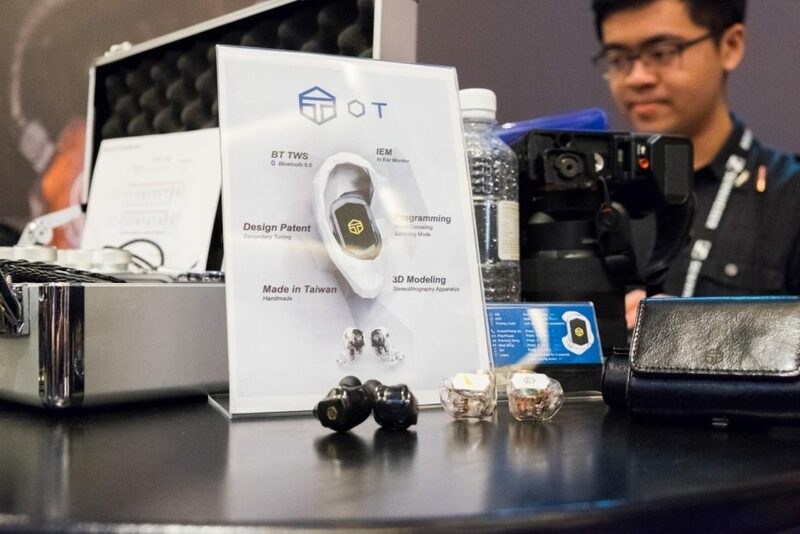 But, I certainly hope those quirks end up being sorted out soon, because a custom Bluetooth in-ear is something I’m sure many would love to have. Music Sanctuary’s most buzz-worthy exhibitor was undoubtedly Bogdan Belonozhko’s FiR Audio. 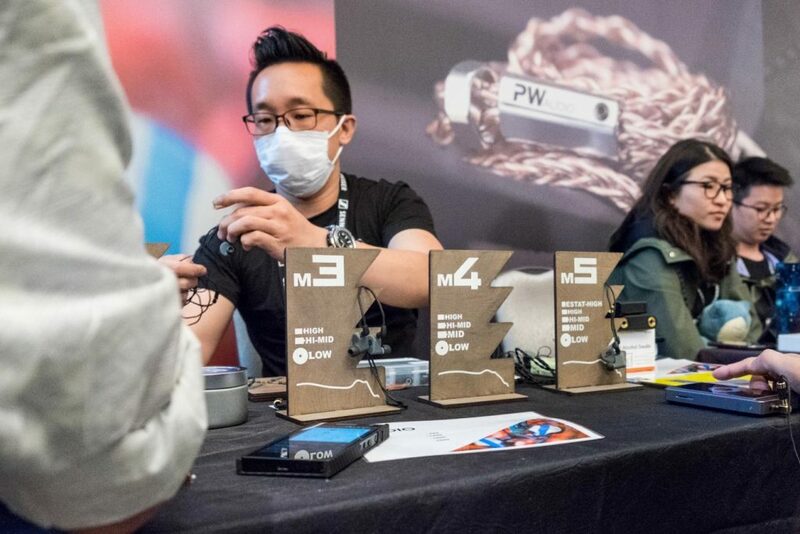 The former 64 Audio head established the company just last year with an acclaimed series of in-ear-monitor-related accessories, including wax vacuums, cable testers and their own line of aftermarket cables. 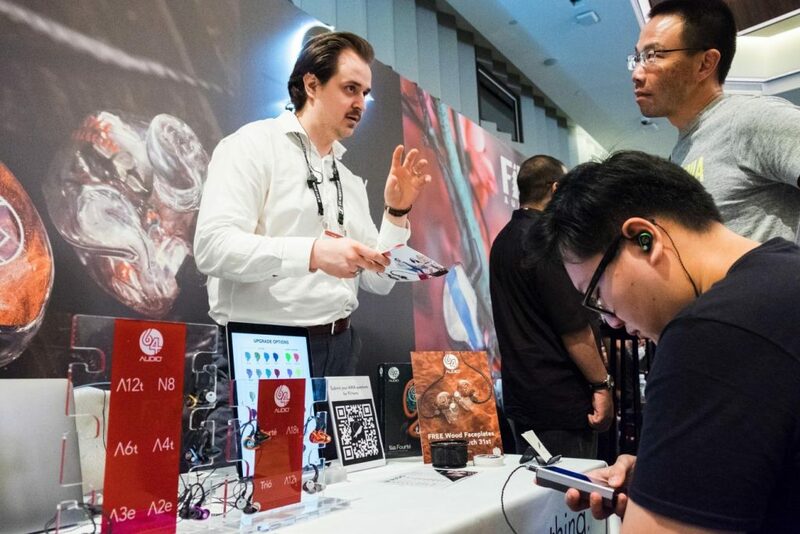 At CanJam Singapore 2019, they made a massive leap and debuted their very own line of four custom in-ear monitors featuring a plethora of in-house technologies. The first of which are fully-tubeless designs. 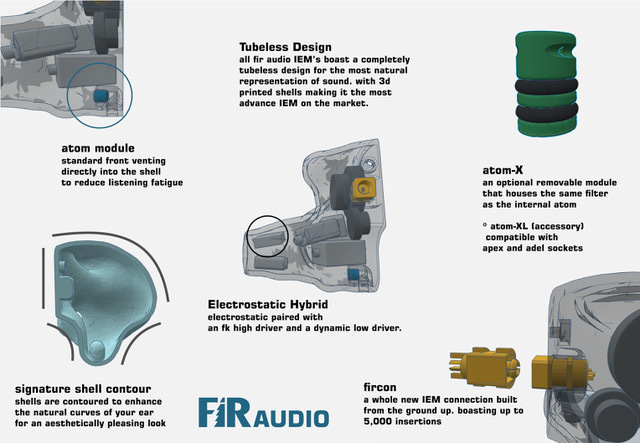 All of FiR Audio’s IEMs feature free-firing drivers that use their shells as a resonance chamber of sorts. In order to control the variances that custom shells will bring, FiR Audio have devised foam-like damping material to control the shell’s acoustics. Secondly, they’ve introduced atom (Air-Transferring Open Module). This module will be installed internally in FiR Audio’s IEMs. And, an optional accessory called the atom-XL will be offered that’s compatible with ADEL and apex ports. Bogdan notes the similarities between the three technologies as controlled air leaks, but stress that atom achieves it via different means, and has also achieved a tolerance of 0.5dB either way. 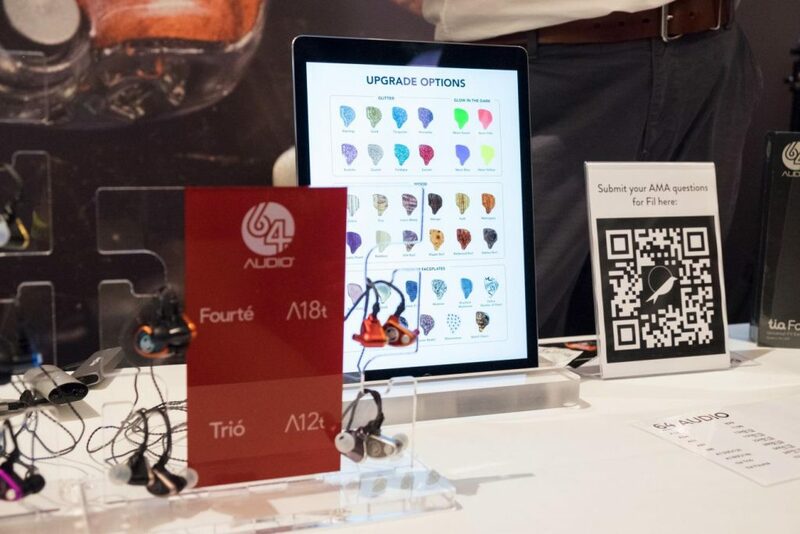 The very last feature they’ve introduced is FiR Audio’s very own proprietary connector system called FiRCON. FiRCON was devised by Bogdan as a robust connection standard ideal for the heavy-duty-use of the pro market. The aim of FiRCON is to provide a rigid connection whilst retaining ease-of-use. To me, it bears slight resemblances to Ultimate Ears’ IPX system more than it does the MMCX. FiRCON does not spin freely. I look forward to further experimentation with the FiRCON standard to see whether or not it does indeed supersede the 2-pin and IPX systems I’ve grown accustomed to. NOTE: I was told that the demo units at the show don’t currently have finalised tunings. In addition, prices are expected to rise slightly too. There are still tweaks to be made prior to release. So, please take the impressions below with a grain of salt. 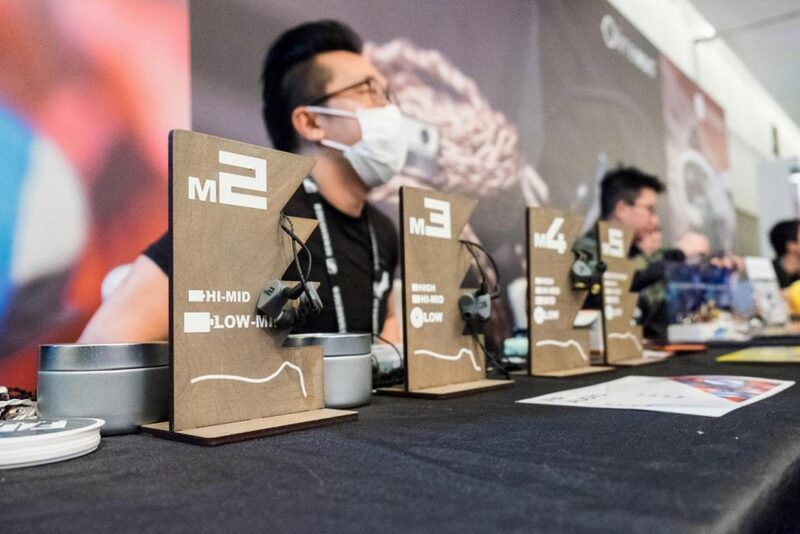 FiR Audio M2: The M2 is the first of FiR Audio’s tubeless in-ear monitors, sporting two balanced-armatures per side. It’s also where the technology’s effects are most prevalent. In terms of spatial performance, the M2 is perhaps the best two-driver performer I’ve ever heard. The tubeless design creates a background that uniquely blends into your headspace. So, instead of being tethered to a background, the M2’s instruments seemingly float in thin air. This creates a stunningly corporeal presentation with dynamic range, eery realism and outstanding imaging. Listening to tracks with elements panned around you like Snarky Puppy’s Chonks feels like listening to a binaural recording; truly unique to say the least. The M2 possesses a natural tonal balance with a smooth, relaxed top-end. It’s a warm, pleasing and forgiving monitor with none of the hallmarks of one. With a laid-back treble, one would usually expect thicker notes bound by wisps of warm air throughout the stage. The M2’s tubeless design defies that stereotype. Instead, instruments are full-bodied, dense and resolved, but surgically separated as well. It’s truly the epitome of best of both worlds; no muffle, no veil. The midrange is free-sounding with bounds of headroom. The low-end is a hair beyond neutral. Taken together with the holographic imaging, what you have with the M2 is a musical and versatile in-ear monitor that won’t ever fatigue. With Custom Art’s FIBAE Black, it’s tied at first place for price-for-performance out of any IEM I’ve ever laid my hands on. FiR Audio M3: The M3 is the first of FiR Audio’s three hybrid monitors. In addition to the two balanced-armatures is a dynamic driver in yet another tubeless design. Contrasting the M2’s more laid-back, even-handed signature, the M3 is an energetic, fun-sounding monitor built upon that dynamic low-end. It’s full-bodied and impactful, but it doesn’t intrude on the cleanliness of the stage. Whether by a swift decay or the tubeless design’s airiness (or some combination of both), the low-end maintains excellent composure despite its liveliness. Counterbalancing that is a crisp, articulate treble with heaps of clarity and detail. It’s an airy top-end with lots of cut, but it’s refined, smooth and inoffensive at the same time. Midrange timbre is perhaps where some may take issue with the M3. At first listen, there’s a bit of a hollowness to it that may take some getting used to. It’s perhaps due to a withdrawn upper-midrange between 3-4kHz. But, it isn’t a prevalent issue once you accustom yourself to the it. Spatial performance is stunning once again. The M3’s soundstage is three-dimensional with a vanishing background, heaps of headroom and strong stereo separation too. The tubeless design’s effects are a bit less prevalent here than they are on the M2. This is because of the M3’s more energetic signature. The instruments here are livelier, so they eat up more of that headroom. The stage is vast and airy, but occupied to a greater degree. Nevertheless, it’s a marvellous achievement for a triple-driver monitor and another strong entry in the line-up. FiR Audio M4: FiR Audio’s M4 is the most vocal-focused of the bunch to my ears. Instruments are built upon a strong, chesty foundation along the lower- and centre-mids, resulting in vocal performances with weight, heft and impact. I feel the low-end is relatively more subdued on the M4, so the majority of its oomph stems from that full-bodied, textured lower-midrange. Male and female vocals alike carry a hearty, bellowing timbre to them that’ll resonate more with those who prefer a more euphonic presentation, rather than those who prefer their vocals sweet, light and laid-back. Paired with that is the M4’s airy, articulate and zingy top-end that complements this body with cut, cleanliness and clarity. Personally, I would’ve preferred a slightly smoother top-end response to push those vocals further towards organic territory. As they are, they’re gorgeously chesty. But, throatier crooners like Brian McFadden or Rod Stewart may find their drier harmonics a hair emphasised on the M4. However, the top-end never does come across dry, harsh or sterile, so it’s a matter of preference, rather than any fault of the M4. Perhaps, I am partial to the M2’s tone. To me, the M4 shines best with simpler acoustic arrangements. Although it’s able to impressively keep up with speedier tracks despite its lower-midrange content, I think the texture and gravitas of the M4 is most prevalent with slower genres. Again, stability, speed and imaging precision are very impressive, granting the M4 its richness with the headroom to match. FiR Audio M5: The flagship M5 is FiR Audio’s entry into the growing trybrid (triple hybrid) space. Sporting electrostats, balanced-armatures and dynamic drivers in a fully tubeless design, the M5 truly represents the pinnacle of FiR Audio’s spatial efforts. Like the monitors previous, the M5 possesses a unique quality where notes seemingly float in thin air, untethered to a background. That effect is further exacerbated on FiR Audio’s flagship, as the electrostat brings an additional sense of depth to the top-end. Transients possess even greater headroom, which further bolsters dynamic range. The stage is outstandingly clean and expansive. Above the other three models, the M5 excels at displaying height in particular. There’s simply more room to play on the M5, resulting in an outstanding sense of effortlessness and air. Detail retrieval is a particular strong suit of the M5. The speed with which it doles them out – along with the vanishing background – results in excellent resolution and transparency. But thankfully, midrange presence and integrity have not been sacrificed in the process. The M5 possesses a solid, three-dimensional midrange with heft, texture and power. Vocalists project naturally with a strong sense of air and layering. This is especially impressive given how freely those instruments feel on the stage. The bass possesses a strong foundation and a natural timbre. Despite the neutrality in tone the M5 leans towards, those organic thumps bring a meatiness that comes across realistic and natural. In terms of tone, it isn’t perhaps the most unique from a flagship. But, spatial and technical performance beyond compensate. It’s a well-balanced, bodied sig in one of the most vanishing, realistic stages I’ve heard, and I hope to hear more of it soon.